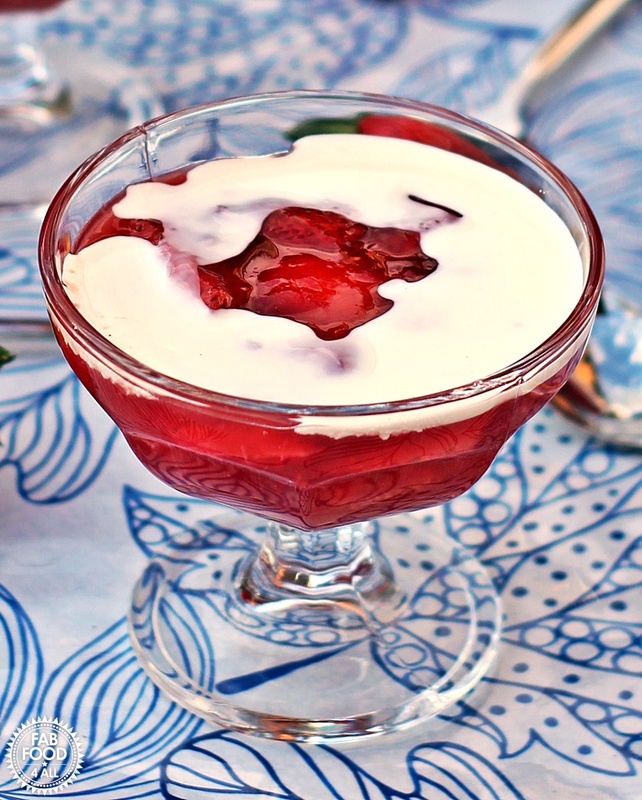 Today I’m sharing Rødgrød med Fløde (Danish Red Berry Compote with Cream) although the literal translation is red groats with cream! This is a recipe I have been meaning to share with you for a very long time as it’s a dessert I grew up with and was always a firm favourite. Hence, when I came across some bargain strawberries the other night I knew the time had come! My mum made Rødgrød med Fløde all the time and there may have been variations but it’s the strawberry version I remember the most. 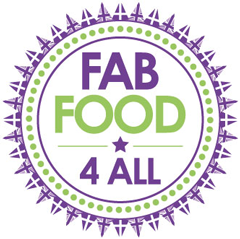 You can make it with any berries or a mixture of berries and even add other fruits like rhubarb. My mum’s Rødgrød med Fløde was always made with potato flour which is used as a thickener but as this isn’t always readily available I have used cornflour which works just as well. There wasn’t any vanilla in my childhood version so if you wish you can leave this out. 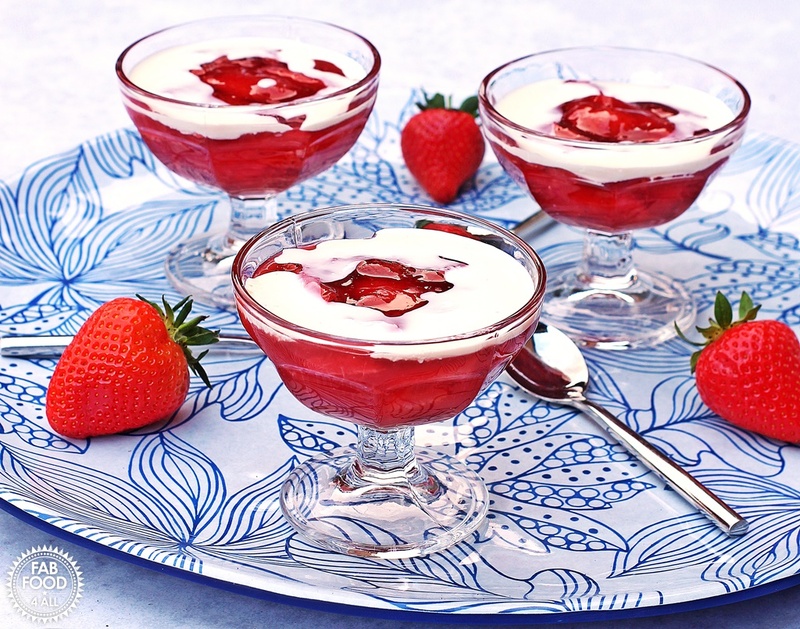 When summer was over my mum would use tinned strawberries so we never missed out on this classic pudding. The other thing I remember about Rødgrød med Fløde is that we would usually have it with milk and not cream, which is healthier anyway so feel free to do the same if you’re counting calories. I made a double batch of this recipe and after a discussion with my mum she said it was best kept out of the fridge and served at room temperature as it can go a bit gelatinous when chilled. However, I noticed that other recipes say you can serve it from the fridge if not eating straight away so it’s probably a case of personal choice. Rødgrød med Fløde is a bit of a tongue twister for Brits to say as there are sounds in it which don’t exist in English so if you go to Denmark you’ll probably be asked to say it. My tip would be to get ahead of the game and head over to YouTube to brush up on your pronunciation! I tired to get my son saying it yesterday and he couldn’t quite manage it, some more practice needed I think. Check out these different nationalities trying to get their tongues around it! 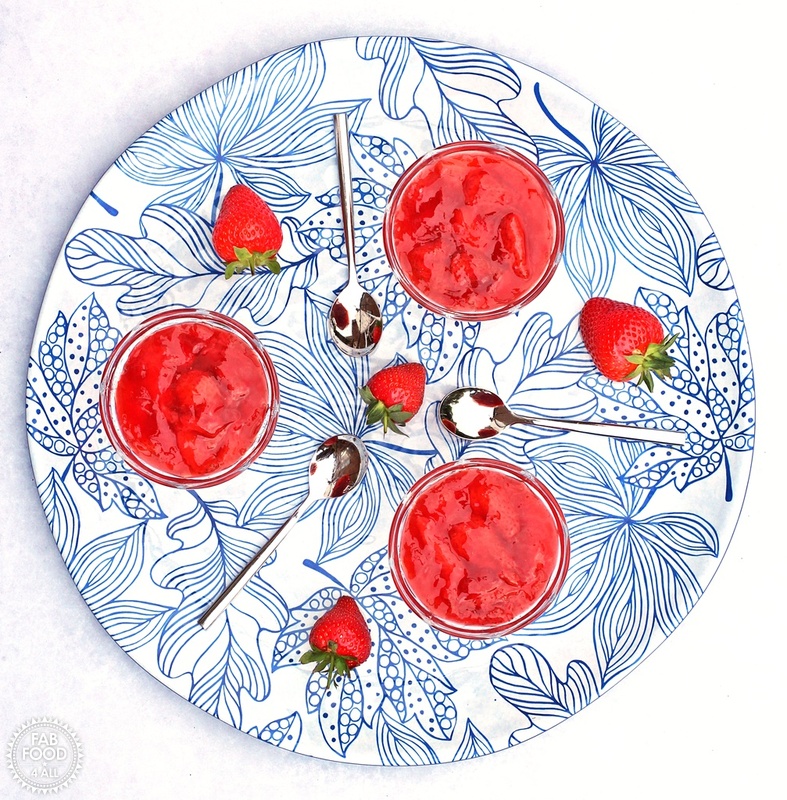 I really need to hang my head in shame that I left it so long to make Rødgrød med Fløde as it’s such a quick and easy dessert to make and a great way to use up a glut of strawberries etc. 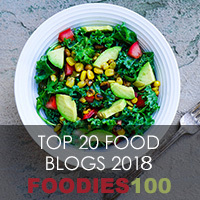 My hubby and son loved it although my daughter wasn’t fussed but I will definitely be making this regularly and mixing up the fruits when bargains come my way. My son was very glad to have the extra bowl full that his sister didn’t want! 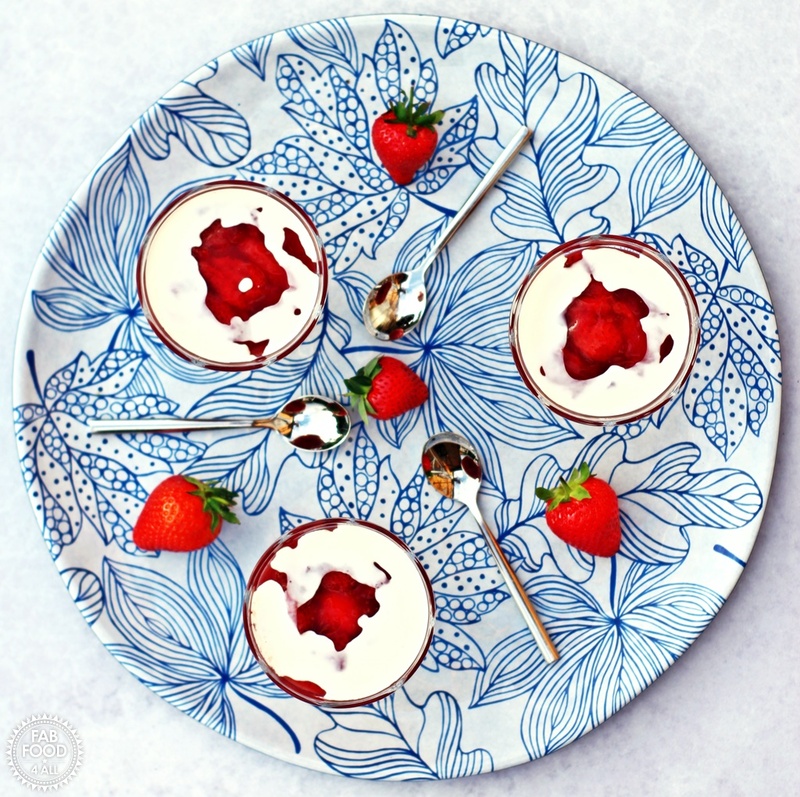 Rødgrød med Fløde (Danish Red Berry Compote with Cream) is a simple and traditional Danish dessert which uses seasonal berries and here I use strawberries. Cut the strawberries in half or quarters if very big, you want even sized pieces. 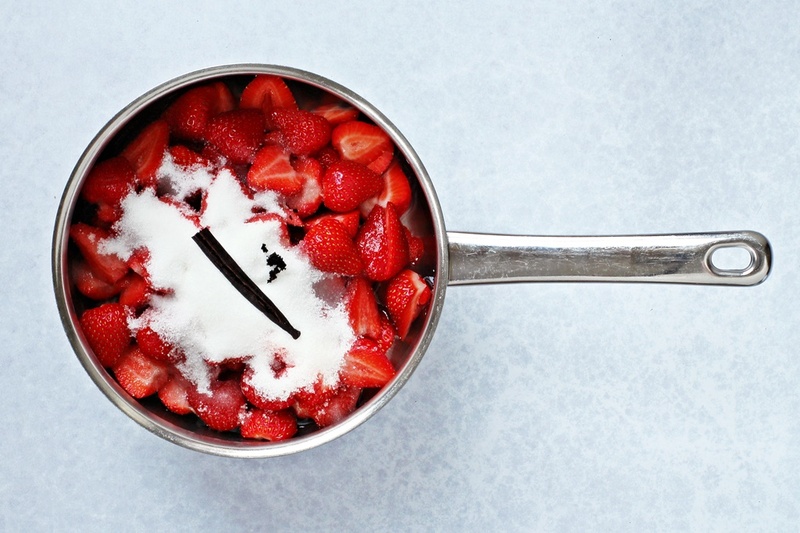 Place the strawberries, sugar, water, vanilla pod and seeds into a pan and stir well to mix. Bring to a simmer and cover with a lid. Cook for 5 – 8 minutes. Add enough water to the cornflour to make a thin watery paste. 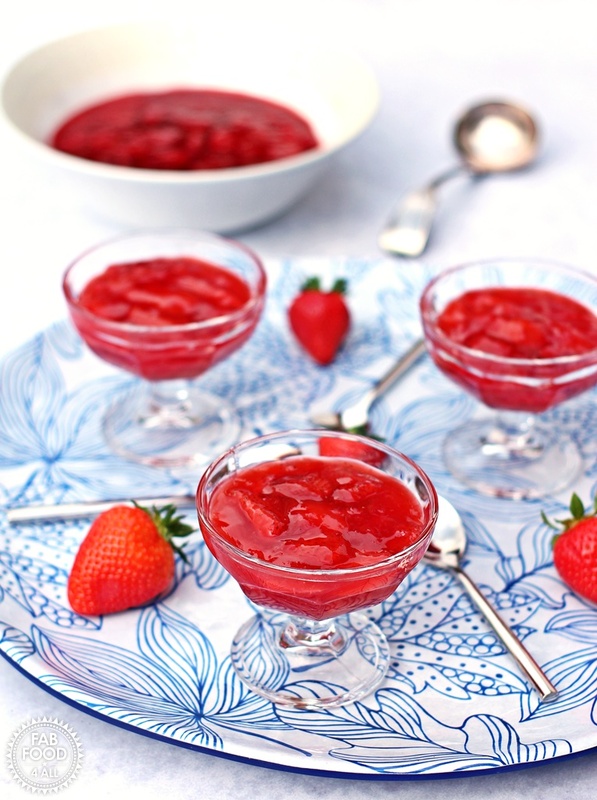 Gradually pour the paste into the strawberries, stirring constantly and carry on simmering for about another minute until the mixture thickens to the consistency of pie filling. (If the strawberry mixture doesn’t thicken add a little more corn flour and water mixture). Pour the Rødgrød into a serving bowl and drizzle with a little sugar to prevent a skin forming. Served warm or cold with cream or milk. I have no idea how you pronounce that but it looks so good. Definitely one to try over the weekend for me. What a gorgeous dessert! I love a good dessert and it’s nice to be reminded that desserts can be light and fresh like this one! Perfect for a summer bbq or picnic!! 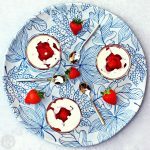 Such a summery dessert, love how simple this is and also love reading recipes that are from your heritage! Oh, this looks lovely Camilla! We went strawberry picking last week and this would have been the perfect way to use them up. I love the sound of this Camilla, I bet it’s packed with strawberry flavour!